Meet Me In St. Louis (1944) is a delightful, classic, nostalgic, poignant, and romanticized musical film - and one of the greatest musicals ever made. It tells the story of a turn-of-the-century family in suburban, midwestern St. Louis of 1903, who live in a stylish Edwardian home at 5135 Kensington Avenue. The city, and the well-to-do Smith family (with four beautiful daughters), is on the verge of hosting (and celebrating) the arrival of the spectacular 1904 World's Fair. However, the family's head of the house is beckoned to New York due to a job promotion - an uprooting move that threatens to indelibly change the lives of the family members forever. 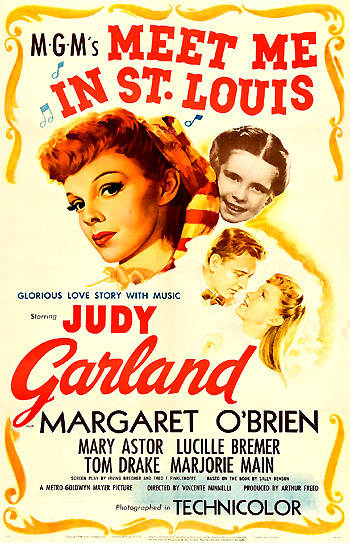 Filmed during WWII, the decision to remain in St. Louis in the film's conclusion affirmed that nothing will be altered for the American family. This gem of cinematic, picture-postcard Americana and youthful romance, is richly filmed in Technicolor. It marked the beginning of the golden age of MGM musicals (and producer Arthur Freed's unit), and ultimately became the second most successful film for MGM (behind Gone With the Wind (1939)). The story is based on the book of the same name from Sally Benson's memoirs of her life in St. Louis, Missouri from 1903-4 - they were recalled and written in multiple issues of The New Yorker Magazine from 1941-1942 (originally published under the title "5135 Kensington" and eventually gathered together as The Kensington Stories). The charming stories, a dozen in all to represent each of the twelve months of the year, are expressed in the film in its musical numbers. The film abandoned the 'put-on-a-show' mentality of so many other backstage song/dance films. Its songs and wonderful performances are carefully and naturally integrated into the story of the close-knit family's day-to-day life, and serve to advance the action and plot from one season to the next. This most popular and financially-successful film was produced by the legendary Arthur Freed and directed by its star's future husband, newcomer Vincente Minnelli (who married 23 year-old Judy Garland a year later on June 15, 1945 - it was Garland's second marriage). The slice-of-life musical was only Minnelli's third film (after the all-black musical Cabin in the Sky (1943) and the musi-comedy I Dood It (1943) with Red Skelton) and it was Minnelli's first full-length film in color. After their marriage, Garland and Minnelli also worked together on The Clock (1945) and The Pirate (1948). Meet Me in St. Louis was nominated for four Academy Awards (without any Oscar wins): Best Screenplay (Irving Brecher and Fred F. Finklehoffe), Best Color Cinematography (George Folsey), Best Song ("The Trolley Song" with music and lyrics by Ralph Blane and Hugh Martin), and Best Scoring of a Musical Picture (Georgie Stoll). The film's awards promotion was subverted by MGM's support of its suspense thriller and gothic melodrama Gaslight (1944). However, young star Margaret O'Brien was awarded a Special (miniature) Oscar as the most outstanding child actress of the year. And this film marked the first significant film role, and probably her career-best effort, for beautiful actress Judy Garland since The Wizard of Oz (1939). Structurally, the film is a series of coming-of-age vignettes (four in number): different acts representing the seasons from summer 1903 to spring 1904 that conclude in the year of the St. Louis World's Fair/Exposition. Each segment marks changes and rites of passage - and is introduced by a filigreed tintype from the Smith family album - each static, initially sepia-toned image turns into color and comes to life. Although the Winter segment is one of the shortest vignettes, the film is still considered a favorite Christmas movie. The First Vignette opens with a static view of a greeting card (or family album snapshot) picturing a lovely, sepia-colored Victorian house in St. Louis, Missouri. When the camera zooms in, the picture springs into an animated, full-color enlargement, showing the mansard-roofed home with dormer windows and a veranda, surrounded by green lawn. The camera tracks down the unpaved street, following an open, horse-drawn wagon carrying Circle Star Beer. It then turns left to track up the lawn, following a young man (son Lon) riding his bicycle onto the Smith house's lawn. The summer scene dissolves into the kitchen. There over the stove, happy housewife Mrs. Anna Smith (Mary Astor) is making ketchup, testing and critiquing its taste with Katie (Marjorie Main), the household's maid. [The opening scene is centered around everyone in the family tasting the ketchup simmering on the kitchen stove, and humming the film's title song.] Two of the five children enter, only son Alonzo "Lon" Jr. (Henry H. Daniels, Jr.), casually humming a bit of the tune of the title song after setting down a load of groceries. (The title song is sung by the whole family in the house.) Then, second-youngest daughter Agnes (child star Joan Carroll) comes in, her bloomers still wet from swimming. As she walks through the kitchen, through the hallway and up the stairs, she picks up the song: "Meet Me In St. Louis." Inside the bathroom, her Grandpa Prophater (Harry Davenport) (Mrs. Smith's father) continues the refrain. He crosses paths with Agnes in the upstairs landing, and then continues singing into his room, where he tries on samples from his exotic lodge-cap collection. He goes over to the window when he hears a foursome arriving, completing the chorus. A lie's a lie, and dressed in white don't help it. Personally, I wouldn't marry a man who proposed to me over an invention. Katie announces the arrival of a coquettish Rose, sauntering up to the front steps of the house: "There's the poor old maid now." Standing on the neighboring lawn is a young, handsome Boy-Next-Door dressed in white with a pipe firmly in his teeth, a new neighbor named John Truett (Tom Drake). Rose gazes at him, trying to attract a glance while entering the house. Rose quickly persuades Esther to join her and stand on the front porch to look at the boy. Attempting to be non-chalant, both desperately want to be noticed and admired. Unsuccessful in attracting his attention, he is oblivious to them and imperviously wanders inside. Rose thinks: "He's not very neighborly, I must say." My dear, when you get to be my age, you'll find out there are more important things in life than boys. How can I ignore the Boy Next Door? With a last lingering glance out the window, she slowly releases a translucent, white lace muslin curtain at the edge of the window - bewitchingly, it falls in front of her as the song ends. Katie: I could hear its spine hit on every step. Agnes: Oh, oh, if you killed her, I'll kill you! I'll stab you to death in your sleep and then I'll tie your body to two wild horses 'til you're pulled apart. To Agnes' relief, the cat is found closeby in the kitchen. While preparing cabbage at the sink, Mrs. Smith advises Rose about her anticipated phone call: "If I were you, I wouldn't commit myself one way or another...after all, we know very little about him. Why, we haven't even met his folks." She also suggests keeping it a secret from Mr. Smith, due home shortly from work: "Not a word of this to Papa. You know how he plagues the girls about their beaus." Esther enters the kitchen and asks where 'Tootie,' the youngest Smith family member is. Nonchalantly, Mrs. Smith replies: "Oh I suppose she's working on the ice wagon." 'Tootie': I expect she won't live through the night. She has four fatal diseases. Mr. Neely: And it only takes one. 'Tootie': But she's gonna have a beautiful funeral in a cigar box my Papa gave me, all wrapped in silver paper. Mr. Neely: That's the way to go if you have to go. 'Tootie': Oh, she has to go. It isn't a town, Mr. Neely. It's a city. It's the only city that has a world's fair. My favorite. Wasn't I lucky to be born in my favorite city? Back in the Smith household, Esther (singing and waltzing in her bloomers) and Rose (on the family upright piano in the parlor) are performing a spirited, reprised rendition of "Meet Me in St. Louis." At the start of the second chorus, Esther rejoins Rose at the keyboard where they sing in close harmony together. In a low-angle shot tilting upwards, the two girls are to the right of the frame, with a ceramic miniature of twin Victorian damsels above the piano to the left of the frame. Breaking the spell, a very hot and grumpy Mr. Alonzo Smith (Leon Ames), the well-to-do lawyer and head of the household trudges up to the house after work at the office and squelches their performance in the parlor: "For heaven's sakes, stop that screeching!" That song. The fair won't open for seven months. That's all everybody sings about or talks about. I wish everybody would meet at the fair and leave me alone. His day has been miserable - he's lost a case. Esther isn't very sympathetic and offers a practical solution: "Well, Papa, if losing a case depresses you so, why don't you quit practicing law and go into another line of business?" As master of the house, he blows up again when he learns that dinner will be served an hour early. He refuses to be coerced into an early dinner, asserts his authority and disrupts carefully-laid plans: "Dinner will be at 6:30!" He stomps off for a cool, soaking, restorative bath upstairs. Just when was I voted out of this family? When the phone rings a second time, Rose answers and hesitantly (but yelling throughout in order to be heard) speaks to Warren while the entire family hangs on her every word. During the phone conversation, Mrs. Smith closes the window to keep the neighbors from overhearing. Rose is unable to coax Warren to propose, though Esther looks on the bright side and breaks the ice: "Well, I'll bet there isn't another girl in St. Louis who's had a Yale man call her long-distance just to inquire about her health." Esther: I'm going to let John Truett kiss me tonight. Esther: Well, if we're going to get married, I may as well start it. Rose: Nice girls don't let men kiss them until after they're engaged. Men don't want the bloom rubbed off. Esther makes a grand entrance down the staircase, greets a few guests, and then deliberately backs into her brother who is talking to John Truett. Esther and John are finally introduced. The youthful dancing party begins in the cramped confines of the Smith parlor. Young Lon participates in the music making - he and Esther sing and the group dances to a lively hoe-down called "Skip to My Lou" - a traditional production number. By the end of the dance, Esther has been gently pushed into John's arms. Esther joins a night-gowned 'Tootie' in a spontaneous, delightful little song and cakewalk to "Under the Bamboo Tree," complete with straw hats and canes in a home-style minstrel shuffle. You've got a mighty strong grip for a girl.